Munjoy South provides 140 rental apartments for low-income tenants, and the owner is required to maintain an equivalent number of affordable units under a covenant that expires in 2042. But state affordable-housing officials say that market-rate units could be added to the site. Munjoy Housing Townhouses Inc. purchased the complex on Fore Street for $13 million late last year from a company affiliated with developer Michael Liberty, according to city tax records. The limited liability company is controlled by Marci Booth, the CEO of the Portland-based LIHC Investment Group, whose principals include Charlie and Andrew Gendron. Kelly Magee, a spokeswoman for LIHC Investment Group, declined to comment on the acquisition. She said the group has been based in Maine for the last 25 years, but most of its projects are in New York and Boston. The group specializes in acquisition and rehabilitation of government-owned subsidized housing, she said. Portland Planning and Urban Development Director Jeff Levine said the new owners have contacted the city, but did not provide specifics about their future plans. Architect David Lloyd said he has had some discussions with the new owner about being the project architect, but has not entered into a contract. He declined to comment on the potential redevelopment. City Councilor Belinda Ray, who represents the district, did not respond to requests for comment on the sale. Peter Ferrante, a 71-year-old former real estate agent, said last Tuesday he recently signed a lease to live with a friend at Munjoy South while he tries to find more permanent accommodations. He said he made an offhand comment to management about how all of the low-income housing would someday be torn down to make way for high-rises. Ferrante said he was told that couldn’t happen – at least not for several years. Munjoy South was built in 1967. It’s a maze of townhouse apartments with small fenced-in backyards connected by paved paths and peppered with small parking lots. 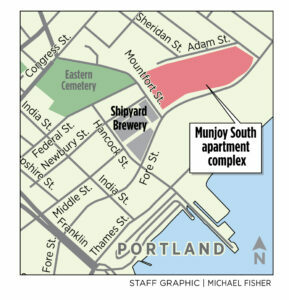 The complex crawls up Munjoy Hill and overlooks Portland Harbor and the eastern waterfront, which is poised for significant redevelopment in the coming years. A small open area, with a playground and basketball court, occupies an upland corner just north of Adams Street. The complex also sits at the edge of the India Street neighborhood, which is seeing some of the most rapid redevelopment in the city, including the new headquarters for Wex, which recently opened, and a new corporate office under construction for Covetrus, a company that provides technology-enabled health care services for pets and veterinary practitioners. When built, Munjoy South was the state’s largest housing project being funded by the federal Urban Renewal program, which offered federal funding to remove so-called urban blight. In this case, over 120 homes were razed and an estimated 300 people were displaced from the nearly 9-acre property. According to news reports, rents at Munjoy South in 1967 ranged from $85 to $140 a month. The rent was intended to be affordable to middle-income earners, which at the time meant someone earning an annual salary of $4,500 to $8,300. Today, according to MaineHousing, 28 units are for families at or below 50 percent of area median income, 78 units are for those at or below 60 percent AMI and 34 units are for those at or below 80 percent of AMI. Area median income for the Portland area in 2018 was $63,070 for a single person and $90,100 for a four-person family. Rents range from a low of $845 a month for a one-bedroom unit to nearly $2,100 for a four-bedroom unit, according to MaineHousing. Munjoy South was acquired in 1997 by Montfort Housing Limited, a limited liability company whose general partners included developer Michael Liberty. Liberty was convicted in 2017 of illegal campaign contributions and now faces federal fraud charges related to investments in a start-up technology company, Mozido. Liberty received over $3.4 million in financing for the purchase and renovation of Munjoy South from the Maine State Housing Authority, according to the agency. That agreement came with a covenant that the property maintain at least 140 units of low-income housing through September 2042. LIHC Investment Group purchased the property from Montfort Housing in late November, according to city tax records. 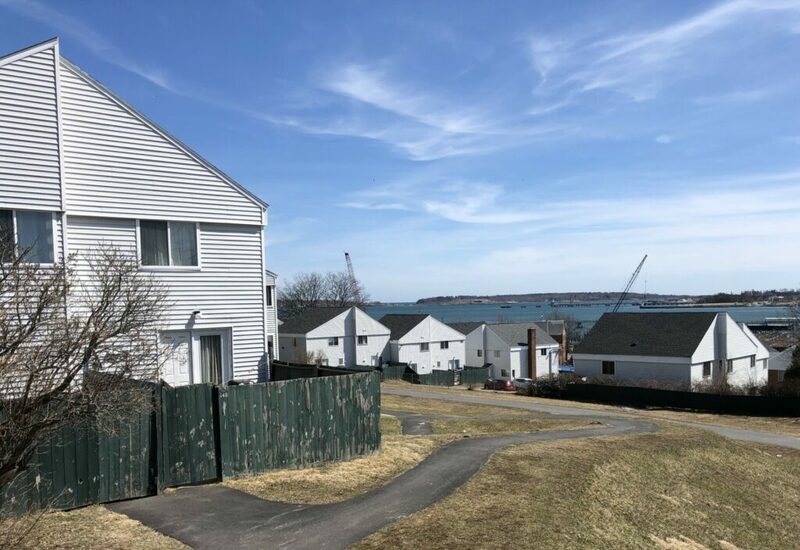 Maine Housing Deputy Director Peter Merrill said the new owner could add market-rate units to the site, and even tear down existing buildings, as long as the low-income units are replaced and the owner finds the displaced tenants a new place to live at the same rent level. Merrill said tenants shouldn’t be too concerned with the ownership change, since Maine Housing requires annual reports on who is living in the units and does a site visit every three years.